Note: combing through my archives I found a couple of articles that I'd neglected to move from draft to publish. Doh! Publishing now even though the are very old. 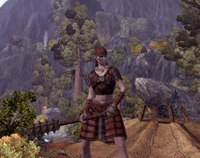 I teetered between re-subscribing to EVE Online and logging back into Age of Conan to work on my Bear Shaman. For the moment, Conan won out. The first thing that struck me when my character materialized in game was, “Damn, this game is beautiful!” I’d logged back in standing somewhere in Conall’s Valley which instantly reminded me of why I had run off to upgrade my video card to play. I appreciate pretty – I need NEED good graphics in an MMO. For me, graphics are an essential part of the immersion. They don’t have to be realistic. High quality stylized like World of Warcraft will do just as well, as long as it’s done VERY well. Less than enthusiastic about running the long jaunts to turn in the pile of quests I had completed (lots of funky issues with the map I’ll QQ about some other day), I was encouraged by my surroundings. If you’re not able to play AOC on high settings you’re really missing a treat. As I was ducking behind trees and skimming along the sides of the mountain to avoid engaging the roaming mobs, I marveled at the foliage, landscape, encampments and surrounding animal life that blended together so well. Yeah, this is why I play MMOs – to see this and feel like this feels. Now if I could do this with less of the BS, such as zoning, running back and forth for trivial reasons (quests), bugged interface elements such as my map that is now gray and I have no idea where the heck I’m headed, MMO life would be much better. And while we’re on the topic of grand graphics and scenery, I don’t subscribe to the decision to make these huge NPC cities that are like ghost towns. The ogling over the imagery and size wears out really fast after you’ve traversed them a few times on foot. Is that really what we need to make the game feel big?? Why on earth did Blizzard erect that huge Draenei city, Exodar?? Every time I went there, more than being impressed by its size, I was like WTF was the point of this? So few players will see it and once they level past this content it will be a damn ghost town, where its sheer size will make it feel even more of ghost town, to new players after the initial wave of characters move past this zone. *Shrug* I’m not impressed by zones bigger than Stormwind when I already thought Stormwind was too big and annoying to navigate. Give me more, big and pretty where it counts – out in the content zones.